The splats in our chairs are curved to fit your back. 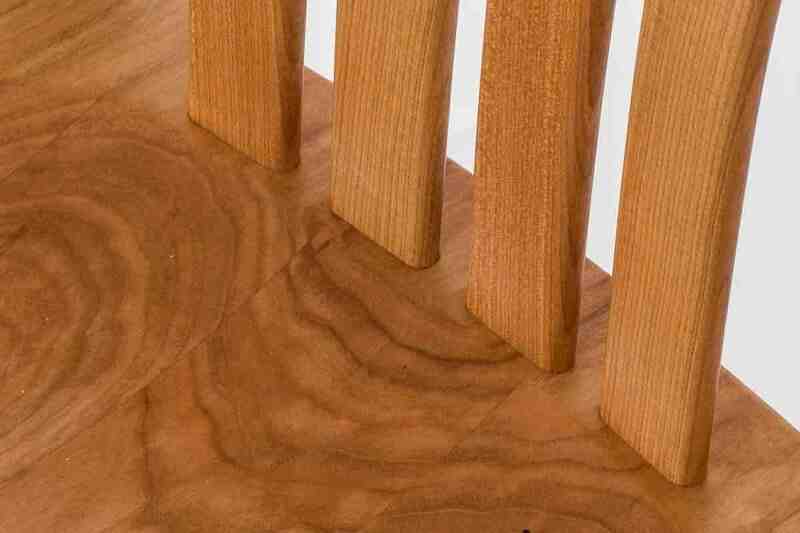 The curve of the back splats of a Weeks Rocker® is proven and precise. We choose two blocks of wood, end to end in the board, that will make at least four splats each. We select so the growth rings are perpendicular to the edge that will become the face of a splat: the strongest orientation. We use a fixture to guide the splat blank over the pattern shaper and true its face to line and curve. With the help of a marking gauge and a point guide clamped to the bandsaw table, we cut a splat from the block, at the same time making a rough cut for the face of the next splat. And so on we go: One of us truing the face of a splat at the shaper, and one of us sawing the splat from the block at the bandsaw. We sand out the milling marks and fit the thickness of the splat at our shop-built chairback sander. We round over the edges on the router table.